A big issue growers in the Southeast are facing is a weevil called cowpea curculio. 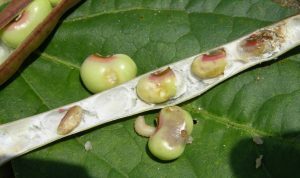 This New World insect is very harsh on Old World peas, such as cowpeas. 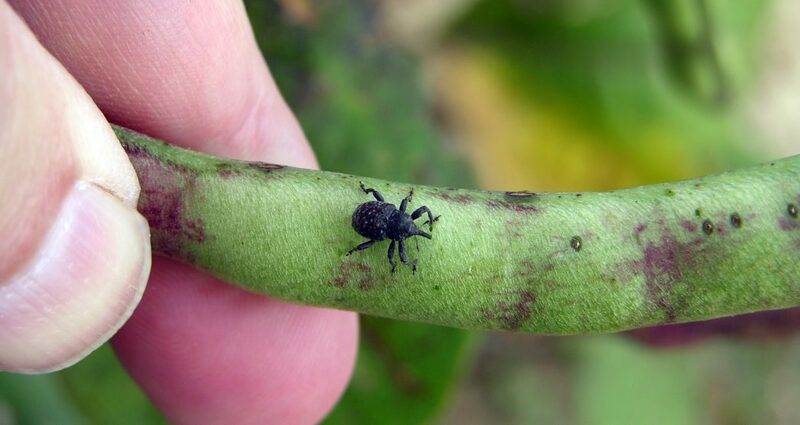 Insects are typically controlled with an insecticide, but this particular weevil has become resistant to many insecticides and can devastate a crop. Cowpea curculio is so hard on the plant that it will knock off the flower buds and damage most of the peas. David Riley, professor of entomology at the University of Georgia, has been looking at various ways to control the weevil. It was brought to his attention that a professor in Australia was working on another cowpea project in Africa. The professor, T.J. Higgins, was concerned about another weevil that growers have been having severe problems with in Africa. Higgins noticed that the New World bean, Phaseolus vulgaris (snap bean or pinto bean), wasn’t affected by this weevil. He tracked the reason down to a gene called alpha-amylase inhibitor. Amylase is the enzyme used to digest starch. An inhibitor stops that normal enzyme from working, so it’s harder to digest. New World beans are not as affected by weevils because the pests have a hard time digesting them. Higgins decided to take the alpha-amylase inhibitor gene from the New World bean and put it into the Old World bean (cowpea). His results from this genetically modified pea show reduced weevil damage. Riley came across this research and thought maybe it would work with cowpea curculio. Last year, he went through the process of getting the permits to get the peas with the alpha-amylase inhibitor modification shipped over from Australia and eventually got the peas this past spring.